Looking out the train window at the snow covered Swiss mountains, I had the biggest smile on my face. I was doing it, I was really doing it. Making my dreams happen. The sound of the train tracks were soothing, feeling the one sweeping motion. It was hard to believe that we were racing down the tracks at 575 km/h (357 mph). The journey was only 4 hours long from Lyon to Zürich, and it was stunning scenery along the way. I was excited to be in Switzerland, not only just to to see the country, but to visit the place where my family is from. I wanted to get to know my roots and to feel that connection to my ancestry and heritage, to the women who came before me. My third great grandmother Sophia Toggweiler immigrated to America in the 1800s. It must have taken so much courage to make a move like that to America. I knew that I would be spending a few days in Zürich, and planned to head to the village of Bonstetten one of those days as that’s where she was raised. It’s about a 30-minute train ride from Zürich city, and Bonstetten is a village of the canton Zürich, which is both a city and a state/province. 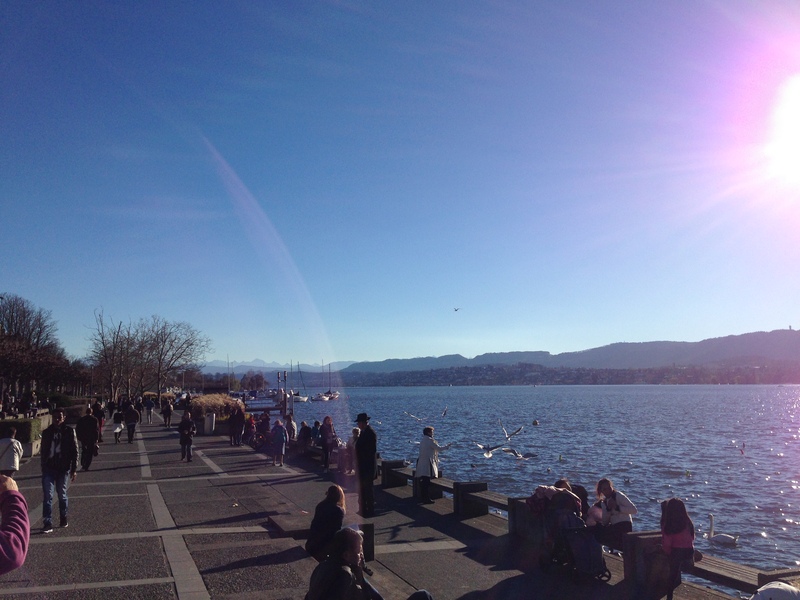 My first few days in Zürich were amazing. I arrived at the train station, which was something out of a European movie, and I stood out front awaiting my AirBNB host who agreed to meet me at the train station since I didn’t speak Swiss German. All the streets and train stops were in Swiss German, so she was super kind to meet me! Her name was Anna and she was a kind, beautiful Swiss woman. She walked quickly and helped me with my luggage. 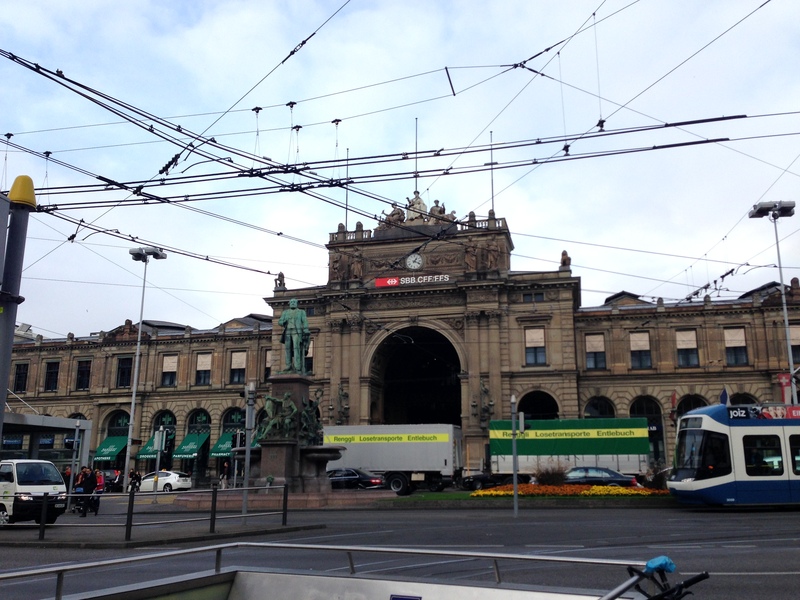 We headed to the tram station and she told me all about Zürich as we walked. 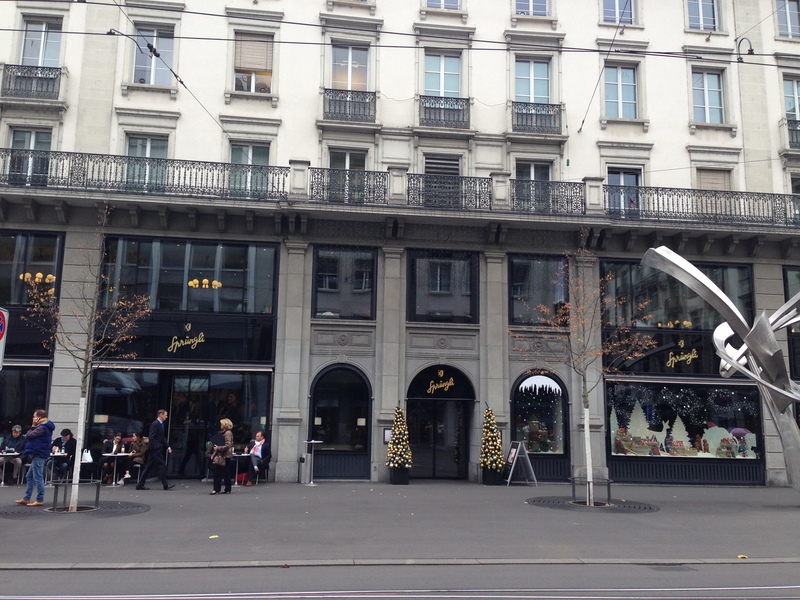 My first night in Zürich, I took the tram downtown to a restaurant near the harbor called Café Felix. I had a delicious dinner and my first Swiss hot cocoa! I made it a point to sample the hot cocoas at many places in Zürich, because why not?! It was November, so it was a bit chilly but still warm enough to enjoy walking around the city. I saw the harbor lit up at night, the streets and buildings emerging with a glow from the street lights and water, and I even saw the Lindt chocolate headquarters! The Swiss architecture is very impressive and iconic, with pointed roofs and tiers that tower above the city. 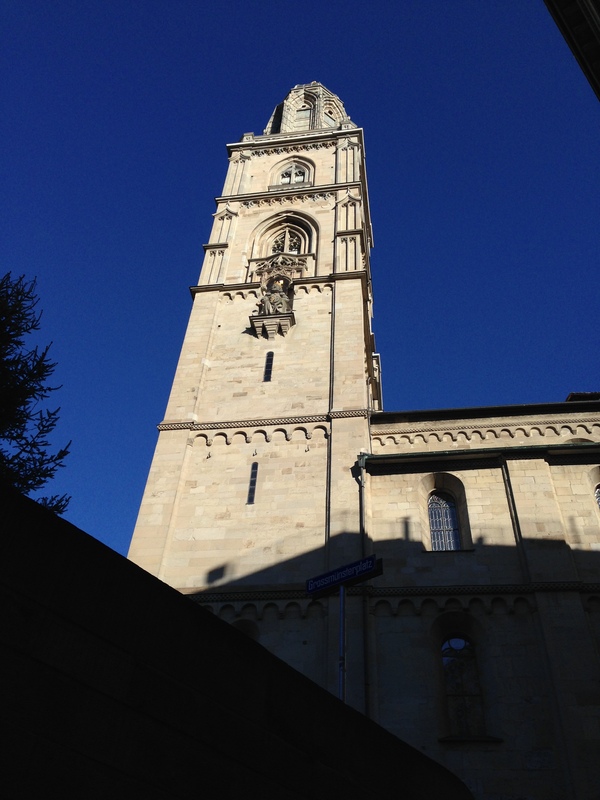 I explored the city my second day and climbed to the top of a 900 year old church called the Grossmünster for about 6 or 8 Swiss Francs. 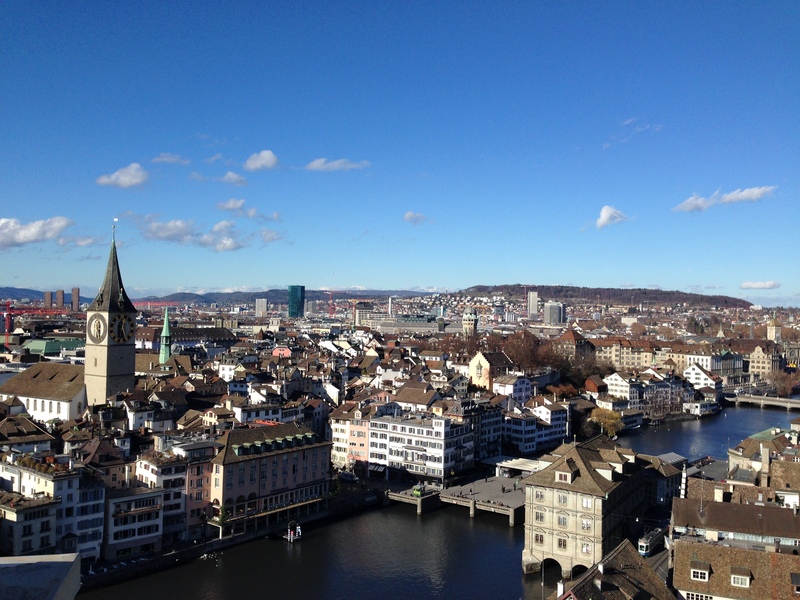 The view of the city and Lake Zürich from there is absolutely epic, so worth the climb! One of my favorite things about Zürich was the hot cocoa and chocolate shops! 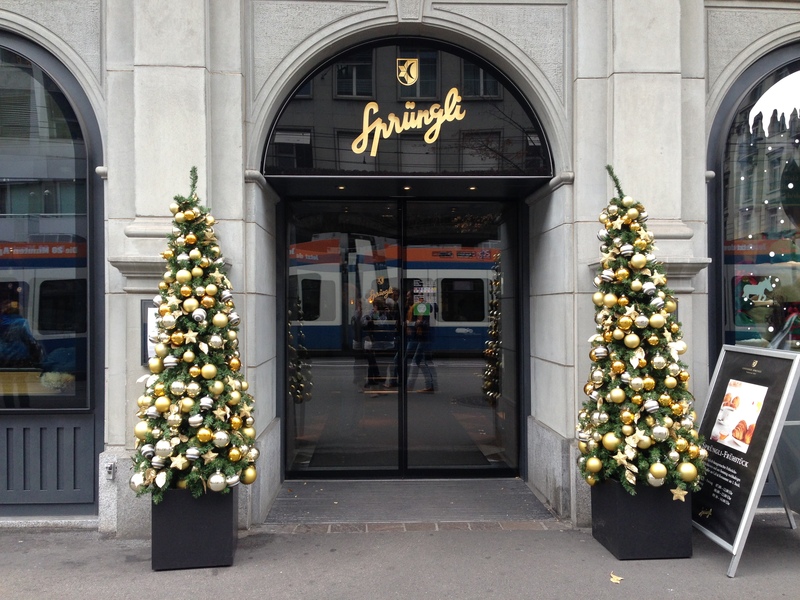 My favorite location for chocolate and hot cocoa was at Confiserie Sprüngli which is also a restaurant with delicious food. The chocolates and hot cocoa though…..they are unreal! 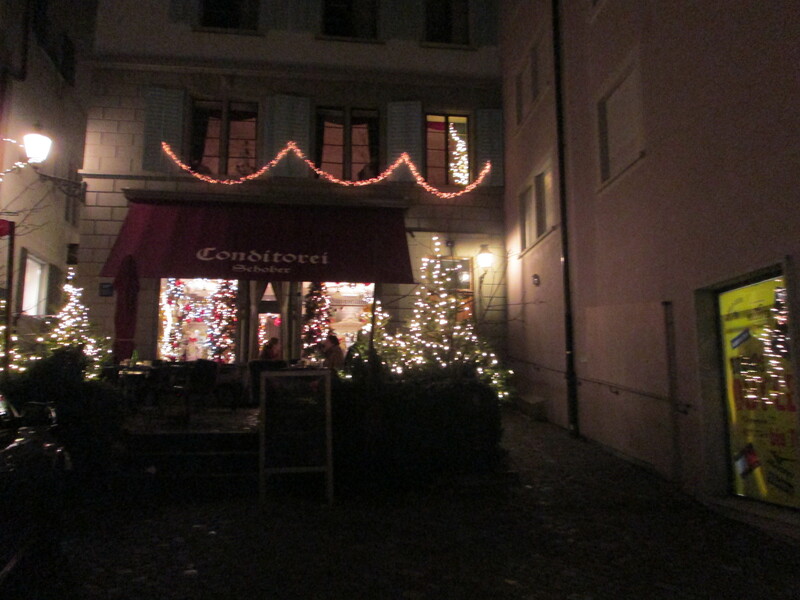 I also tried Café Schober and had a really nice meal there as well as a great cup of hot cocoa. There is a candy shop across the street from Café Schober with traditional Swiss candies, and that was fun to go into a Swiss candy store, not going to lie!! I bought so much Swiss and French chocolate while I was in Europe as gifts for myself, and family and friends, that I had a whole other backpack just for all of the stuff I bought. (More humorous stories on that in my post about Iceland). While in Zürich, I went downtown near the harbor one afternoon around noon and saw all of these people having lunch outside in the sunshine. They were sitting on the steps of the waterfront and looked so happy. Everyone was eating out of little white boxes and I thought, ok this must be a local thing! I have to figure out what this is! So I asked someone, “what is everyone eating?” And they informed me it was a local food joint with amazing rice or noodle dishes – so of course I had to try it! It was absolutely amazing. I can’t remember the dish exactly, but I felt like a real local sitting there in the sun, enjoying the views, watching the swans in the lake near the harbor, the boats coming in. It was a delightful day to say the least. I remember being so nervous…what would these people think, me coming to their town to ask about my 3rd great grandmother and family name? Would they know anything about Sophia Toggweiler Roseacher or why they immigrated? What if my distant relatives were still there? How amazing would that be. I just wanted to see it for myself. 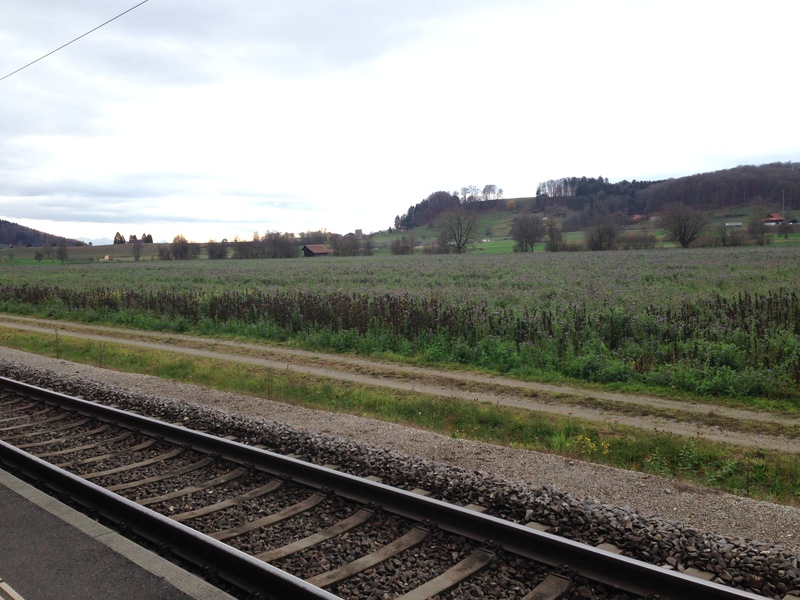 The 30-minute train ride from the city of Zürich to Bonstetten was of course scenic. Switzerland is stunningly beautiful. The countryside, the mountains, the valleys, all the cottages with smoke escaping from the chimney. We passed other villages and hills of green covered with churches and Swiss homes, the shadowy outlines of other high mountain peaks in the distance. It was so beautiful. When I stepped off the train, I saw fields of purple wildflowers in front of me. It felt so welcoming. And like a movie honestly. Standing at the train station, I looked around and thought, “wow, I can’t believe I’m really here.” I love wildflowers. They have significance to my story and journey even in moving to Europe, so it felt inviting and like a moment of synchronicity. Once I got off the train, I had to take a bus into the village / town center. All of the signs were in Swiss German, so it made it increasingly difficult to navigate and communicate — but I managed! I was in the Swiss-German speaking part of Switzlerland, but my French is useful near Geneva and that region. Being that Switzerland borders many countries in Europe, there are four languages spoken: Swiss-German, French, Italian, and Romansh. On the bus ride from the train station we passed historic buildings, churches, Swiss cottages, and farms. The bus driver dropped me off near the town hall and I recognized the Bonstetten flag. I had contacted the town hall beforehand via e-mail and they gave me instructions and told me to come to the office there. When I stepped off the bus, I thought “wow, I’m really here”. This is where my 3rd great grandmother lived. It was a beautiful village surrounded by mountains and farmland and historic architecture. I stepped into the town hall and told them I only spoke English and French, and luckily they spoke English. I spoke with two ladies and told them I had contacted the office and was there to see if they had any information about my family. They were impressed that I made the journey from Zürich just to be there and they were so kind and willing to help. They first told me that they knew someone still living there with the last name Toggweiler (my grandmother’s maiden name), but that they were not home at the time or out of town. They couldn’t give me addresses of course to visit because well, that’s not legal haha. But they said that they knew of the family name. They mentioned the church down the road and that they might have records as the Swiss are known for keeping tight family records, specifically through the church. The ladies said that I could come back of course if I had the time but I only had that one day to spend there. They gave me a few gifts to keep — a town cook book published with recipes from all the locals and information about the town and village. They gave me stickers and all kinds of gifts! I was so grateful for that, for their kindness and welcoming spirit. That meant so much to me that they would gift me with these items. I looked through the cookbook that day and recognized other family names too. This was such a special gift to me. This was a piece of heritage and connection to my ancestors. The best kind of souvenir. I walked over to the church to see who I could find. The historic building stood tall and proud in the center of the town and had a beautiful blue and gold clock tower. I saw a few ladies outside and asked them about family records. They invited me into the office and looked up my family name and found several people of course. It was just neat to confirm that my family had indeed resided there a long time. They were so kind to me and we talked with me for a bit and they told me to enjoy my time exploring the town. I left the office and walked around the front of the church — and the bell starting sounding — this giant clock tower that had rung hundreds and thousands of times before…..it rang so loudly and beautifully. I just stood there thinking how my grandmother also heard this church bell at some point and I wondered if she stood in the same place as I did. I wondered how she met my 3rd great grandfather (William Roseacher) and how or where they married, if it was once they got to Nashville/Davidson County. I wondered what inspired them to move — was it a promise of wealth and a successful life in America? Was America paying immigrants to come settle in Davidson County? What inspired them to leave everything for this new land? I continued walking around the town and seeing local pubs and homes, still hearing the bell in the distance. I found my way to a park and started walking down the path, looking at sheep and cows in the pasture beyond me, with rolling hills in the distance. It was a beautiful sunny day. I met a woman along the path pushing her kids in a stroller and we talked briefly. She welcomed me and told me I was brave for coming there to visit and that it was inspiring. We continued on our way and I found a bench. I sat there looking at the beautiful scenery and the Swiss flag in the distance. I took out the chocolates I had bought earlier in the day at Sprüngli, wrapped cutely in a box with ribbon. I sat there eating my chocolates one by one (I bought like four chocolates I think), and I just savored the taste of that moment. 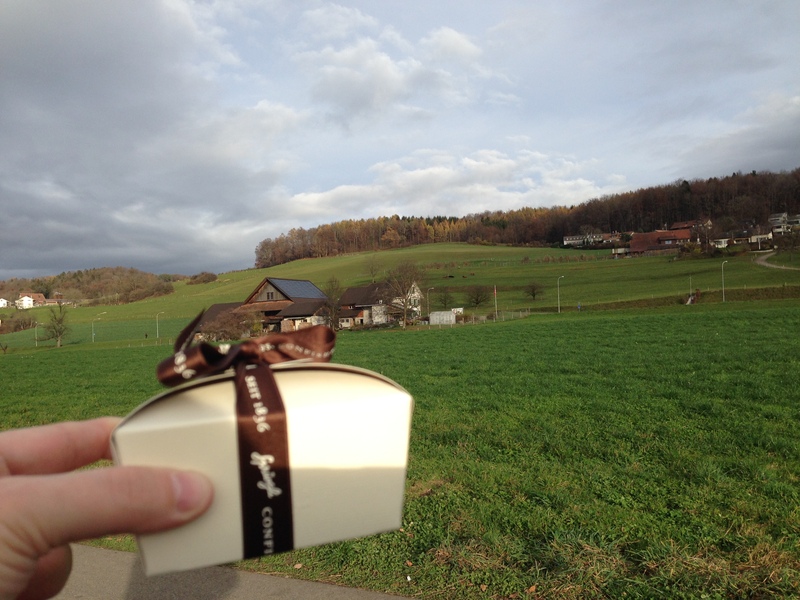 Here I was, eating delicious Swiss chocolate in my grandmother’s village. This was real life. I made this happen. And it was a moment of such deep connection for me. I felt like I was supposed to be there. I wondered what she would have thought of me and my journey. My moving to France at 27 and stepping out into the unknown and choosing an alternative lifestyle. I feel like she would be proud of me, that we had a similar spirit of bravery to leave and travel abroad and leave our country, even if for a brief period of time. I saw the train pass by and heard the whistle, reminding me that I had to get back soon to the bus stop. The sun would set soon and I had to make it back to Zurich. I went back to the town center and had all of my gifts and belongings with me. People greeted me as if I was a local, and I felt honored by that, even though I only knew how to say hello in Swiss German, so I would manage to say “Grüezi!” with a friendly wave every now and then. A gust of wind came through and blew some of my papers out of my hands. This elderly woman walked up to me, smiling, speaking Swiss German, helping me pick up the papers. I told her I spoke English and she smiled, still talking to me in Swiss German, assuming I would get it eventually. I feel like I understood her that day, even though it wasn’t fully translated. Her smile was so kind. And I was impressed with how the elderly Swiss people were so active and full of life, riding bicycles around town and walking everywhere! The lady and I exchanged gestures while I waited for the bus, and I’ll never forget her white hair and gentle smile as we waived goodbye. I managed to sneak into the cafe at the corner to get a snack and Swiss pastry and a soda water for the bus. I stepped onto the bus with gratitude that day, for those few hours I was able to relish in Bonstetten visiting my Swiss roots. Once we got back to the train platform, the sky was aglow across the train tracks and dusk had arrived. I felt my journey was complete that day. Another epic train ride from Zürich to Lucerne was filled with one hour of stunning mountain views and glacial lakes. The Swiss mountains are unparalleled with some of the most beautiful peaks in the world. Leaving the train station in Lucerne puts you immediately on the edge of Lake Lucerne, crossing bridges on foot and heading to the town-center. It was cold, but not yet snowing in November 2015. I enjoyed the crisp air as a cozy invitation to have as many hot cocoas as I wanted while roaming the city 🙂 Because when you’re in Switzerland, it only seems right to cozy up to a cup of hot cocoa. I found a Starbucks which was interesting because they’re familiar yet different locations around the world. I spoke with a girl attending university locally and she filled me in on the culture. We talked about Christmas since the holiday season was soon approaching and it was super cool to hear Swiss traditions of celebrating St. Nicholas. The Swiss celebrate Christmas a little differently, really with the focus being on the story and history of the real St. Nicholas honored by gift-giving and community festivities. Lake Lucerne at sunset took my breath away. The pink hues on the horizon, the snow-covered peaks, the glow and reflections on the water, the moon in the sky. I stood there on the bridge taking in the views and appreciating my day in Lucerne. It had been a full day – with lunch in the town center at a cute restaurant with an outdoor patio. I visited the 14th century walking bridge across the river from the town center. I explored the whole city on foot taking in the views and history and architecture, trying different foods along the way. I love learning the history of each place I travel to. 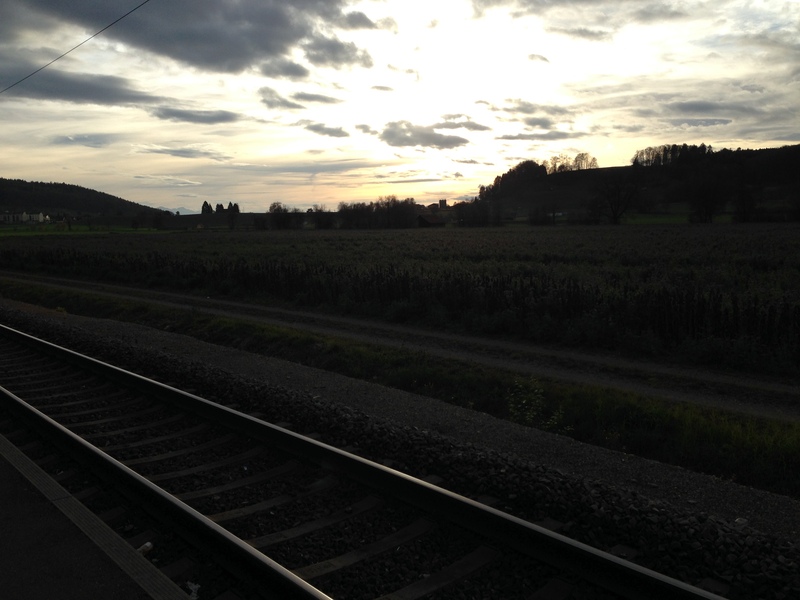 That evening after the sun set, I had trouble figuring out which train to take to Sursee which is where I was staying because it was a quaint Swiss town that had more affordable AirBNB options than Lucerne. I went back to the train station in Lucerne, looking at the time tables, trying to figure out the next departing train but my internet wasn’t working so I couldn’t find anything online. There were several restaurants at the train station upstairs with lovely views of the city, so I decided to dine there that evening. It was actually a delicious meal, buffet style, and quite busy as well. I ended up asking a local woman about the train schedule and she kindly offered me her phone and helped me find the next train. I was so grateful because usually language barriers weren’t an issue, but in this part of Switzerland, not everyone spoke English or French. I appreciated the kindness of strangers throughout my travels. It rebuilt my trust in humanity. 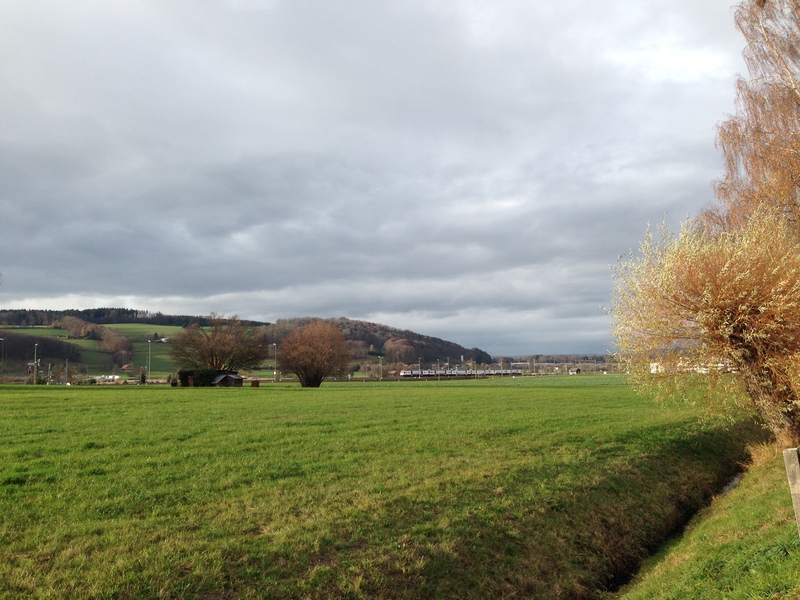 After dinner, I took the train to Sursee and then a taxi to my AirBNB. I arrived at this cute apartment, where these 3 girls lived, and they were around my age. All of them were school teachers and we got along so well. I hung out with them that night and watched a Swiss tv series. We talked about politics, culture, global issues and more. It was so neat to learn about Switzerland, the lifestyle, healthcare, government, and more. That’s one thing I appreciate when I travel is learning from many different cultures. The next day was a rest day. 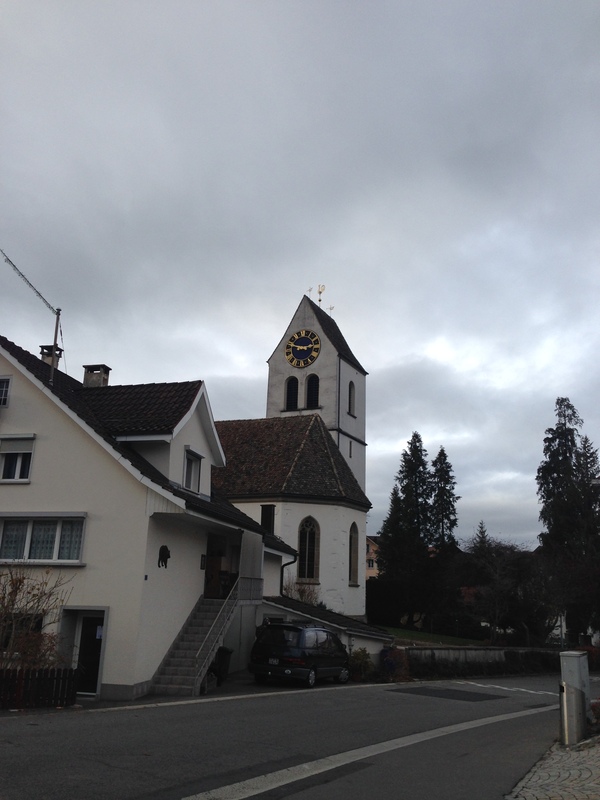 I had planned to stay in the village of Sursee for a night or two and explore the town, coffee shops, and local fair. 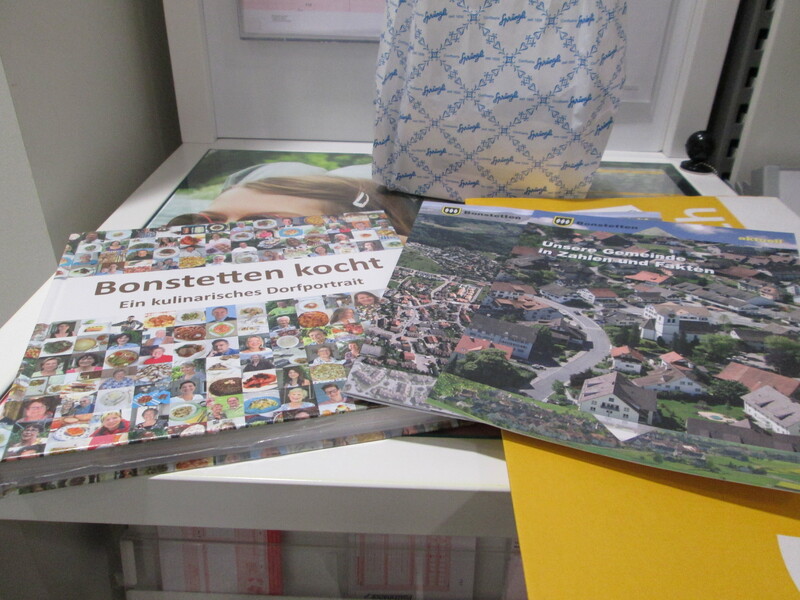 I needed to go to the post office to send back a suitcase to the States and my gifts from Bonstetten. 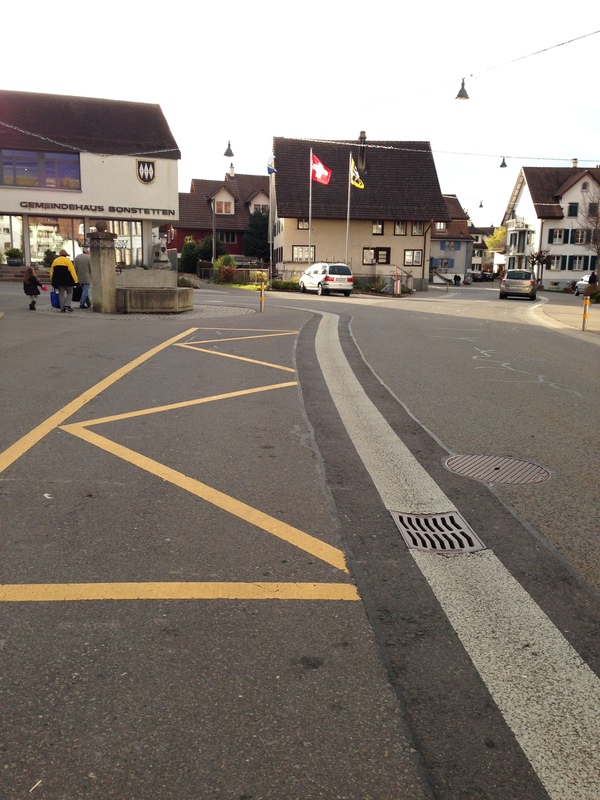 Sursee is a village that sits 25 minutes outside Lucerne by train. It’s an easy train ride with panoramic mountain views. 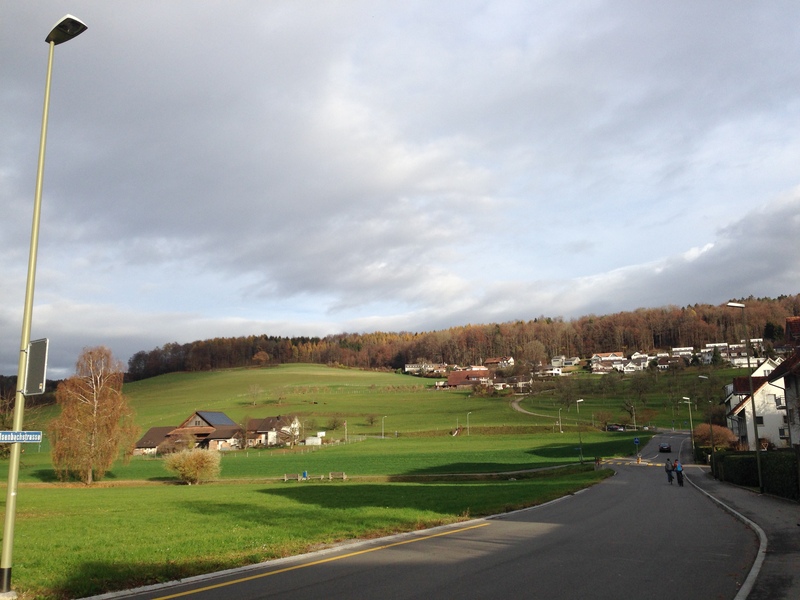 People greeted me in Swiss-German here more than any other place, and I felt so at home. I smiled and waved back, saying hello in Swiss-German, and I enjoyed seeing all the locals biking through the town. I saw the first big snowfall of the season from Sursee. It was quite magical actually, walking through the snowy weather into a cozy coffee shop in this little Swiss town. My 2nd day in Sursee was really fun and relaxing. I explored the town, the boutiques, restaurants, local coffee shop, and the Swiss fromagerie where I got the best local Gruyère cheese ever! In France and Switzerland, at the cafes, all the coffees come with wrapped chocolates of some sort, or cinnamon cookies like Biscoff. Super cute. My experience at the Swiss Post office was interesting. No one spoke English in Sursee hardly at all — so when it came to ordering food, I was pointing at menu items, and trying to communicate with the post office staff was almost impossible. The man became frustrated because I couldn’t speak Swiss-German (and I think he expected me to because I look Swiss of course) and so I wrote everything down that I could in Swiss-German. I just needed to send back my small suitcase and the gifts from Bonstetten. I had left several things with the girls at the AirBNB, including a cute pair of boots, but I couldn’t manage with 2 suitcases anymore. After an hour at the post office, I finally made it through and had successfully sent off my items, and managed a smile from the man at the counter too. That was a success because I don’t think they were used to visitors. My last day in Switzerland was so beautiful. I saw the first big snow of the season. I spent time in Luzern this week with views of the Alps covered in snow. I sent one of my suitcases back to America full of clothes and shoes I didn’t need. Considering I had to take 5 trains today all the way back to France, I was so thankful to finally just have my 1 giant suitcase and backpack. I ate at a local shop inside the train station and sipped a coffee with a little Tobblerone Swiss chocolate that came with, staring at the Alps, trying to take it all in. I almost missed my train from Zürich to Basel because I was buying Swiss chocolate in the train station just once more before I left. 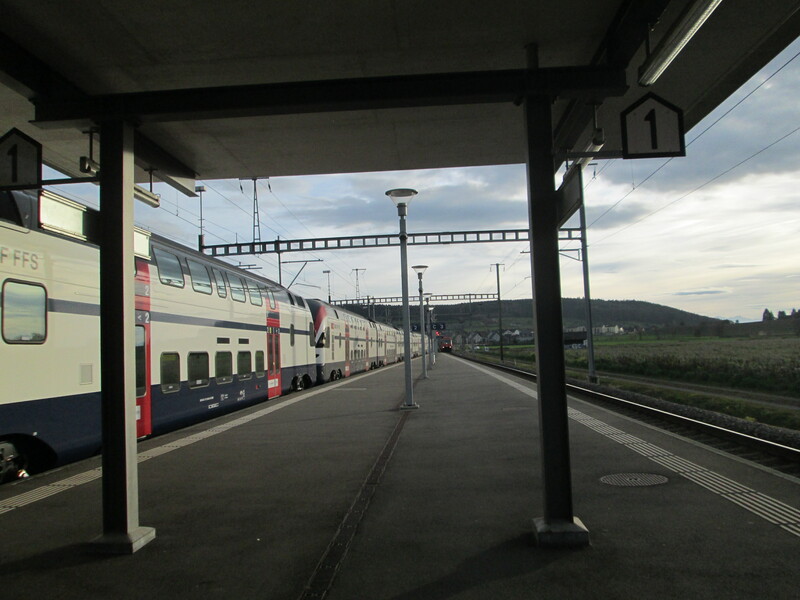 But luckily the train was cancelled anyway, so I whispered a thank you to the heavens 🙂 It has been an adventure to get back from Switzerland – our train broke down in Dijon – I met some awesome people my age on the train and we played cards the whole way back to France. I am SO glad to be back in France and speaking and hearing the language I know again. Though I managed to learn a few Swiss-German words. What a week! All I need now is a glass of wine, some cheese, a croissant, and a crème brûlée. For real. I remember it like it was yesterday…how it all started….the prompting in my soul telling me the time was approaching…sitting at my parent’s kitchen table on my 26th birthday, talking with my mother about life goals and dreams and all the things in between. Our birthday is a great time to reflect on how far we have come and where we want to be in the next year and beyond. Having just celebrated my 28th birthday in June 2016 in Canada, it reminded me of how far I have traveled on my journey in the past two years, geographically and personally, and how much these travels were a part of my personal growth. That was one of the most life-changing conversations I ever had with my mother. When you have lived in or near your hometown your whole life (Chattanooga, TN was my home for 5 years during and after college) — and being an only child — you have a lot to consider when you make an international move or voyage. I had traveled frequently throughout the past several years so my parents were used to that. However, this was the largest voyage I would be undertaking thus far and I would also be traveling alone throughout Europe with certain connections in some cities. I had traveled alone many times before, but this was going to be the largest solo adventure yet. The next month, July 2014, I headed to Guadeloupe for a 2 week ministry trip where I worked as a French translator for a team from the U.S. and with the French team from Agape France. Guadeloupe is a beautiful French Caribbean island located in the Lower Antilles. After returning from that trip and having been immersed fully in the language for 2 weeks, I was glowing. I was in my element and speaking French about 75% of the time. I considered moving to Guadeloupe and even Montreal in Canada, thinking it was closer and possibly easier to do a move to those places and use my French there. Many possibilities ran through my mind. Ones that might have been easier than crossing that big ocean. It was a literal journey as much as it was figurative. To sail off a shore that was very familiar to me, toward a place in the world with soil that I had never stepped foot on, and knowing I wasn’t coming right back after a week or two. I was nervous and a little scared, but the curiosity and the calling was louder than the fear, so I ran towards it with joyful anticipation. October 2014 rolled around and I wandered into a local coffee house one evening. A nice gentleman and business owner that I met randomly that evening asked me an important question that I will never forget. I was there only to work on my resume that evening and search for new jobs, with thoughts of starting my own business at the forefront of my mind. As I returned to my work life and small one bedroom apartment that week, I started to ponder the reality of this dream. Could I really make this work? Could I part ways with most of my possessions, my cute little apartment, my secure job here (though job security is mostly an illusion and just gets us too comfortable sometimes.) I knew I was ready to move on from the company I had been with for almost two years. I had dreamed of starting my own business to transition out of that job. Could I really step out into the unknown and the uncomfortable? How was I going to make all of this work and come together? 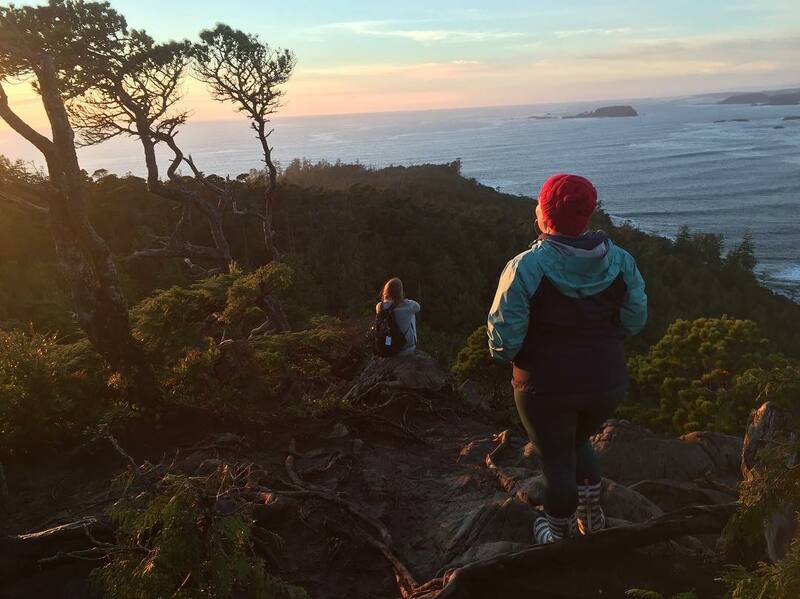 Through all of my outdoor and travel adventures from years past, I knew that one thing was true….if I wanted to experience the truest joy of being myself and the aliveness that I had experienced before, I had to be comfortable with being uncomfortable. I remembered the feeling during adventures of the past, not a simple high of life, no, this was more than that. It was a way of life. The feeling you can get on any adventure is the euphoria of going beyond where you thought you could in order to experience the extraordinary. Pushing yourself further than you thought you could go. It is the joy of each moment. It is the joy of realizing you are exactly who you were meant to be and exactly where you need to be geographically. As weeks were going by, I knew I was serious about making this dream happen and I posted this photo on my Facebook and Instagram pages at the beginning of 2015. I had this picture of the Eiffel Tower lit up at night sitting on my mantle, a gift from my parents in recent months. I decided it was time to stop looking at that photo of the Eiffel Tower. I wanted to be in Paris and see it for myself. I wanted to break free from the norm of what it meant to be in my mid-twenties in America. Who said I had to have my own apartment, a 9-5 work week, a nice car, and the American Dream? I didn’t want the American Dream, I wanted my own dream. To live on my own terms, not the terms of others or trying to meet society’s expectations. That’s not a dream or real freedom, that’s being stuck in a social construct. So I decided it was time to aim for something different, the extraordinary adventure of risking a move to a foreign country and I was ready to see where that would ultimately lead me. I knew it was going to be a journey through the next year to get to the point where I could leave for France. I finally quit my job at Ramsey Solutions in April 2015 and transitioned to running my own business, Yours Truly, Events & Personal Assistant which I had been working on for months prior. I began to watch some inspiring movies over those next few months, The Holiday; Eat Pray Love; and The Secret Life of Walter Mitty were prominent ones. Quotes started arising at that time from these movies and books and random places, pointing me onward. These inspirations were helping me make huge steps toward my year long travel journey. I had no idea I would end up traveling through not just France, but also Switzerland, Iceland, then later Canada to complete a year long journey. In the Summer of 2015, I was in the middle of running my own business, finding the freedom and time to set myself up financially by selling everything I owned. I still didn’t know the exact date I would be leaving, but I knew it was time to start selling everything. I had a huge yard sale for starters, then continued selling all my furniture and belongings online through Facebook trading posts and Craigslist. One year after being honest with myself about what I really wanted and seeing the vision of my dream — I was on a flight to Paris, France. The morning of October 15th, after an overnight flight and layover through Iceland, the plane started to descend above the outskirts of Paris…the clouds finally broke through…and I saw, for the first time, the French countryside filled with villas and cottages and old churches and fields. I could not believe my eyes. I teared up as we approached the Charles de Gaulle airport. I was tense with excitement from this long, ten hour journey from Nashville to New York City to Reykjavík, Iceland to Paris. In the following days and weeks, I would come to experience the beauty of a three month voyage throughout France, Switzerland, and Iceland. I grew to understand the philosophy of the French, joie de vivre, which I didn’t realize was a French saying ironically until a year later. I discovered and experienced this joy for myself on this voyage. I made it happen along with the help from many kind people and opportunities and synchronicity from this grand universe we live in. I never knew such joy existed. Following your bliss will ultimately lead you to where you need to be, always. Have you ever had a vision and dream that you could not stop thinking about? It always comes up somehow by random conversations, people you meet, places you go. It won’t leave you alone because there is a vision and dream waiting to be unearthed. It waits to be discovered and brought to light and realized. That’s what France was for me. The idea of going to Europe had been on my heart for years. Particularly, France felt like a vitamin I needed — I longed and craved for it like Vitamin C, there was energy in this place. I knew that spiritually I was supposed to travel to this place for a season and there was an exchange that needed to take place. I needed France and France needed me. The people I met and the things I experienced all came into perfect harmony even in the imperfect moments. I realized how fluently I speak the French language; I spent a week in Switzerland and traveled to the village of Bonstetten in Zürich where my great, great, great grandmother Sophia Toggweiler was born and lived before immigrating to the U.S. in the late 1800’s with her husband, Charles Rossacher, my great, great, great grandfather. I spent time throughout France, with families and friends, in the mountains and outdoors. I explored and discovered and learned so much. And on the way home I spent a week in Iceland which was absolutely incredible and also a huge part of my journey. The beauty I captured and experienced through this journey I will never forget. So where did it all start? What makes a girl move to a new country at 27 years old? Perhaps the curious nature she was born with…the need to explore the world… to discover… to adventure beyond the comfortable…to find what makes her soul feel alive and present to the beauty of this world…to be in a place and culture that matches her own priorities, passions, lifestyle, language, and spirit…to share the joy and energy she has with the world…to be spiritually alive…to learn…to meet people from around the world…to cross cultural barriers and grow. The love for travel, the outdoors, adventure, and the promptings in my spirit started at a very young age. I had always been an explorer and adventurer, traveling to wherever I could to see new places and worlds uncharted, even if it was discovering something new in my own backyard. My skydiving experience in October 2010 taught me a lot about myself and paralleled my view of our journey in life sometimes. There are times in our lives that we don’t have it all figured out or every detail in place, but we know that we must do something that has been calling us, a constant whisper, a passion. And sometimes you have to jump, before you’re “ready”, and trust that you have what it takes, both internally, and externally to make it happen. I had taken trips and adventures over the years to other countries and parts of the world. I spent time all over the U.S., particularly my favorite area, the West. I camped and hiked for 3 weeks in the Grand Tetons National Park in Wyoming while leading a trip. I hiked and traveled all around Utah, Colorado, Arizona, and California. I did skiing, climbing, paddling, backpacking and more. I went sea kayaking in Florida off the Keys. I hiked parts of the Appalachian Trail in Virginia’s Shenandoah National Park and visited Washington D.C. I spent time in Michigan and saw the Great Lakes. I spent time exploring in the Carolinas, Georgia, Arkansas, and all over my beautiful home state of Tennessee. I had explored many places and ventured on many, many travels. I saw my smaller dreams come true for sure, always finding a way to pursue my heart’s passions and the adventures that make me feel alive and bring me true joy. It’s all about connections and taking the opportunities you have before you. I synced with North Face’s motto: “Never stop exploring.” That idea is part of me I think, in my DNA. And I hope to keep exploring always. I had also used my French in many of my travels, all over the U.S. and meeting people to speak with everywhere I go. I even spoke with the French in New York City in 2014, and in Guadeloupe that summer where I spent 2 weeks on the French Caribbean island, translating for a U.S. ministry team which ultimately connected me to France. I considered moving to many other places and knew I was restless staying in Franklin, Tennessee long-term. So I couldn’t ignore it anymore. There was still a bigger dream that had always been there and it was a bigger leap. It would require more of me than ever before. This bigger dream was to move to the country of France for a season of my life. I started studying the French language when I was 14 years old. I fell in love with the language and the culture and the European way of life. I pursued the language with diligence and continued learning, speaking and practicing ever since. I finally arrived in France and could be immersed and speak all the time. Overall, the dream was not just to use my French. It was also the desire to explore this place for more than just a week or two on a vacation. I knew that if I traveled there, I wanted to spend at least a season of my life there if not more at some point. All of it is a gift that I’m grateful for EVERY single day. I don’t take any day for granted. I see the beauty in all things. Call me a romantic or an optimist, I’m really both. And I’m also a realist. Life is hard sometimes and it requires much of us and there are challenges and obstacles and we grow personally from all of these things. This journey has been equally challenging as it has been magical and beautiful, and I see the beauty in the challenges too. Every day. I’m also grateful that I had the flexibility and opportunity to make this move. I was in between running my own business that I started in early 2015 and seeking other potential career paths. I was no longer satisfied with any of the “career options” before me and I knew I couldn’t settle. I never really liked the idea of the “American dream.” That wasn’t my thing or my goal. To have enough, to live simply and enjoy life, to build a life and be successful on my terms — that was my dream. And to keep traveling of course, in the most affordable ways possible. I have many passions and pursuits and hobbies, and I want my work to include those in some form or fashion. I realized in those months leading up to my move to Europe that it was time to stop waiting for the next step. For the “perfect time.” This WAS my next step. This was the perfect time. And it was time to sail away. To get to France, I decided to sell everything I owned and combine that with savings to fund my 3-month stay in Europe. It’s just stuff. I didn’t need a car in Europe and I definitely didn’t need more stuff. I have been happier this season of my life with little and the minimum than I ever have been before with tons of stuff. I did what it took to get to Europe, including being willing to be uncomfortable both before I left and while I was there to experience the adventure fully. To me, that is where I find the adventure of life, in the times we are willing to be uncomfortable as well as enjoying the journey. The in-between. Being uncomfortable awakens our senses to being alive. We focus on our needs, not just our wants. We can soak in even more the simple things and moments. At least that is my experience. My hope is for others to see their dreams through too, if they haven’t already. If traveling to Europe, or anywhere abroad, is on your list, I have a few tips and some helpful information on my page: How to Plan & Pay for Your Next Adventure. 2) If you know in your heart you are being led in a certain direction and the opportunities are before you, you feel balanced spiritually, you aren’t just being impulsive, you’ve thought it through, the resources are there, the door is open? GO!!! The time is now. All we have is the present and we can’t let life pass by and let it happen to us. We get to happen and be present in this life, to create, to move, to have a voice and a choice, to affect the world, to share our stories, and to live freely and joyfully. We have a vote. 3) Warning: You may have haters on your path as well as supporters. You will discover you have 3 types of friends: those who pretend to be happy for you; those who are not happy for you at all (which are the “friends” you usually end up letting go of and may have not been actual friends to begin with); and those who are authentically happy for you and want the best for you, celebrate with you and your joy, your successes, and are true friends. The last category is the type of friend you want to keep close. The healthy ones. 4) Be prepared for both negative and positive reactions. Be open to wisdom spiritually and practically. Be vigilant as you consider your direction and decisions. But at the end of the day, this is your life. And the haters don’t get a vote. You be you, and you let them be them. Be un-apologetically you and be the best version of you. 5) Your dreams CAN come alive. It might take time, planning, saving, sacrifices, and connections. But if you know you’re supposed to do something, you must do it intentionally and courageously. 6) Lastly, do not give up. Keep moving forward. Always.